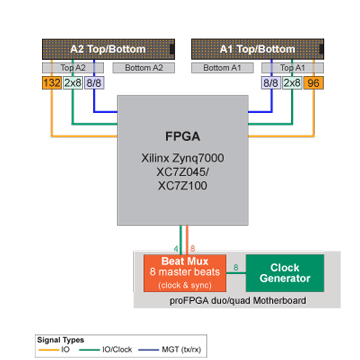 The proFPGA product family is a complete, scalable, and modular multi FPGA Prototyping solution, which fulfills highest needs in the area of FPGA based Prototyping. Part of this modular and flexible system concept is the proFPGA Zynq™ 7000 FPGA module, which can be easily mounted on the proFPGA uno, duo or quad motherboard and mixed together with various other proFPGA FPGA modules like the proFPGA Virtex 7 2000T FPGA module. The proFPGA Zynq™ 7000 FPGA module addresses customers who require a complete embedded processing platform for high performance SoC Prototyping solution, IP verification and early software development. The FPGA module offers a total of 2 extension sites on the top with 260 standard I/Os and 16 high speed serial transceivers for extending the board with standard proFPGA or user specific extension boards.